Whether or not Apple’s flash storage pricing on the new MacBook Air and Mac mini is worth it, is an exercise for the reader. 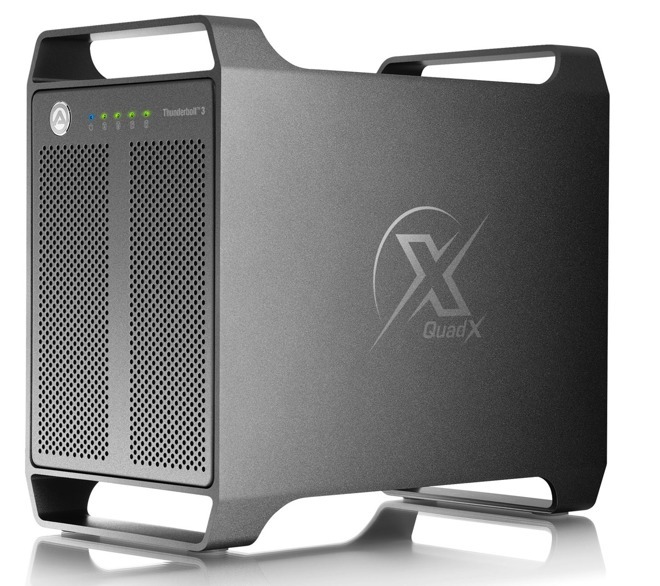 But, given the high-speed Thunderbolt 3 interface on both of the new machines, as well as on the MacBook Pro and iMac, there are a variety of avenues to choose from to add storage to a Mac, quickly – and we have some that we’ve used and can recommend. In an ideal world, you’d like multi-gigabyte per second speed, in massive amounts of terabytes, and you want it cheap. The three are incompatible, though, so it’s probably best to prioritize what’s most important to you. And, unless you have an unlimited budget, with all priorities, assembling your own storage array is probably your best, and cheapest, choice. As a note, we’re not looking at single-drive enclosures that deeply, and we’ve already picked some good network attached storage devices. For the most part, this article will cover advanced home users, small businesses, the “Prosumer” market, and the “Pro” workflow not including large groups needing simultaneously-accessible mass storage. SAN units and enterprise multi-homing network attached storage are topics for another day. We’re aware that there are literally thousands, if not tens of thousands, of options. But, this isn’t just a random list —we’ve used all of these, and recommend them to our readers. Most of the enclosures we’re talking about here come with no drives. Prices can vary hour-to-hour depending on specials, so we aren’t listing any recommendations for drives here. We’ll list some of the better ones we see on our Twitter feed going forward. Just be advised that the specials you see may be quantity or time-limited! Well, if that’s the case, just spend the extra bucks for the storage built-in. Apple’s PCI-e based flash storage is as fast as it gets, and will be internal should you choose this option. But, there is another option. If you want to use the Thunderbolt 3 bus about as fast as it can go, there’s the Node Lite Thunderbolt 3 drive from Akitio that fits the bill —but at a cost. Akitio is bundling the Intel Optane 905P 960GB PCIe SSD that can handle 2.6 Gigabytes per second read speed, and 2.2 Gigabytes per second write speed, with it’s PCI-E enclosure that as an added bonus has a DisplayPort 1.2 for an external monitor. If you want to “roll your own”, the OWC Thunderbay 6 will take six 3.5-inch hard drives. Using OWC’s SoftRaid or to a lesser extent, Apple’s Disk Utility, users can line up those drives any way they want, for maximum speed or maximum data protection. We’ve mentioned enclosure maker Akitio a bit earlier in this roundup. They have a lower-cost option, if all you need is an enclosure to toss your drives in. The Thunder3 Quad X will take four drives with a simple sled mount and easy access —and gives you a downstream DisplayPort to connect an external monitor to your chain. CalDigit’s T4 RAID is one of our favorite enclosures we’ve used. The unapologetic use of a lot of metal gives it a nice look, and it has some niceties like lockable drive sleds and a DisplayPort 1.2 port that are a bonus. Plus, using CalDigit’s utility, you can put the four drives in the enclosure in a RAID. In the unit we have on hand, we’ve seen read and write speeds of four 3.5-inch drives hit 750 megabytes per second in RAID 0, and about 525 MB/sec in RAID 5. 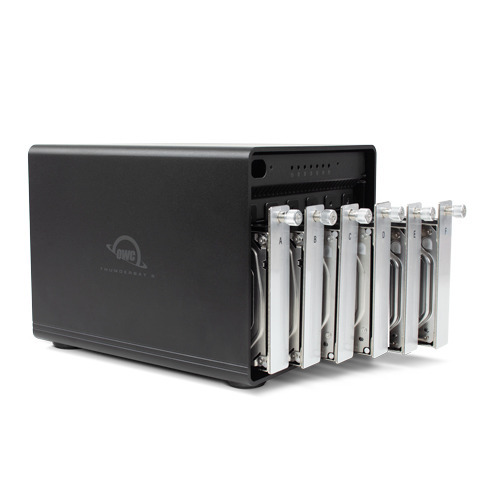 CalDigit’s T4 can be had for $799 for 8TB, ranging up to $2799 for 32TB. You’re probably going to have to go USB 3.0 type A to save some dough on a large drive array, though. The Mediasonic PRORAID 4 uses a USB 3.0 connection, with up to four drives in the enclosure —that as a bonus has a hardware RAID controller. But I don’t need massive drive arrays, and I’m on a budget! If you’ve got a pair of matching 2.5-inch hard drives or SSDs kicking about, you can make a pretty fast assembly with the pair in the right enclose. We’ve been using the Mediasonic ProRaid enclosure with USB 3.1 type-C generation 2 connectivity privately for about a year now with cast-off 2.5-inch SSDs, and we’re seeing in excess of 750MB/sec read speeds. But, if you’ve got just one drive, the choices are numerous and can be a bit bewildering. 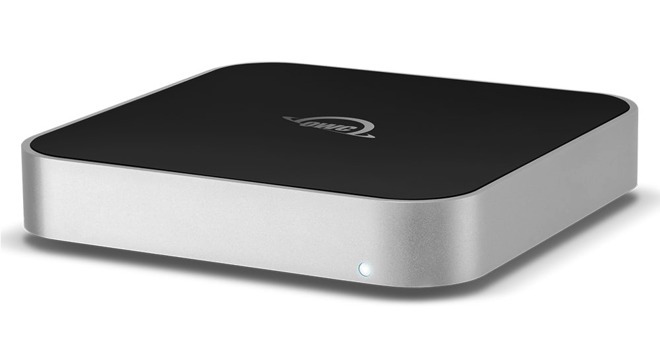 We like the very simple Cable Matters USB-C enclosure for a single 2.5-inch drive. If you’ve got a 3.5-inch drive that you want to toss in an enclosure, we like the Nektek USB-C enclosure. There’s been a lot of talk on the forums about a drive enclosure that matches the styling of the Mac mini. OWC still has the Ministack, which will fit underneath the computer with no footprint addition, and contains a single 3.5-inch drive. At present, it uses a standard USB-A to USB-B connector, but that’s fine, given that the Mac mini still has those ports —and you could always buy a USB-C to USB-B cable for about $9 if you wanted.